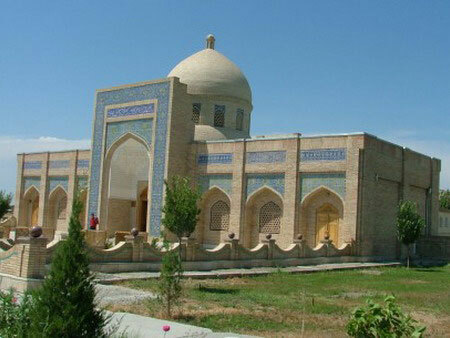 One of the most important religious sites of Bukhara – Memorial complex of Bahauddin Naqshbandi is located 12 kilometers from Bukhara. Once it was place of settlement of Kasri Arifon, which was famous for its pagan customs and holidays. Now, there is the mausoleum of the famous Sufi philosopher of the East on the site of rites of fire-worshipers. Bahauddin Naqshbandi was the founder of the order, which later was named in his honor. Moreover, his philosophy became life-affirming for many figures of the East, and today his teaching is still relevant, annually attracting a huge number of pilgrims of all ages from different places. His philosophy can be described by one his phrase: "Dil ba yoru dast ba kor" - "The heart with God, and hands at work." Even the symbol of the Order is the heart with inscribed word "Allah" in it. Bahauddin died in 1389, and in 1544 Khan Abd al-Aziz built over his grave the crypt and surrounding buildings. Exactly in this look the complex has reached our days: the small minaret, the austere dome of the mausoleum, gray and ordinary buildings. This place is not popular among tourists, because the pilgrims observe their rites and pray here. But everyone, who visited it, says about the peace of mind and serenity of this place.